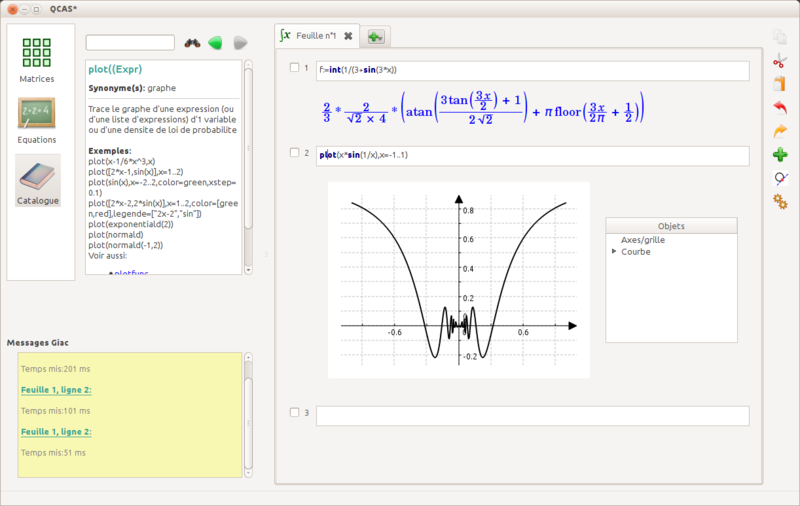 In 2012 Loic Le Coq (the author of xlogo) made a Qt front end for giac and called it qcas. The Qcas forum is located on xcas site. Since 2013 I have made some modifications and binaries. For More details look at the git repository of Qcas. In particular, qcas can now use the same giac library as xcas, so the speed and functionalities are similar. Qcas can open (and export to) Xcas files, but note that 3D graphics, spreadsheats and turtle mode are not implemented in Qcas. 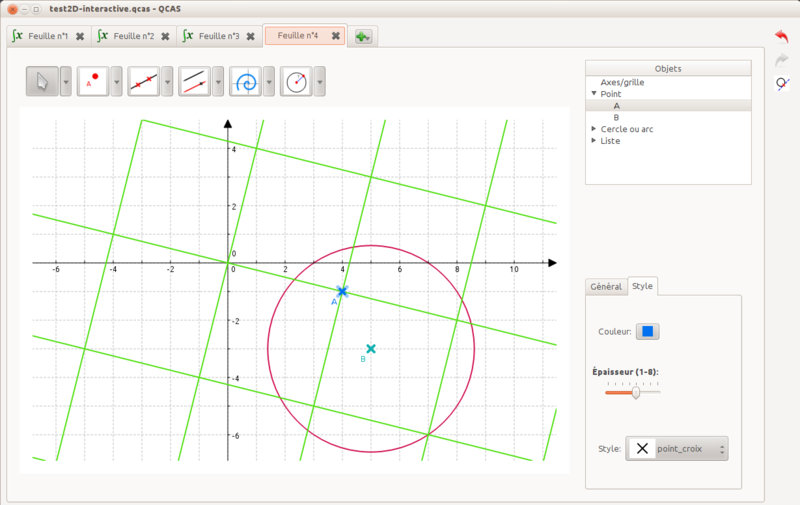 Moreover interactive geometry is not fully compatible and the values of the variables are note saved in the files. So after opening a file with Qcas you must reevaluate. 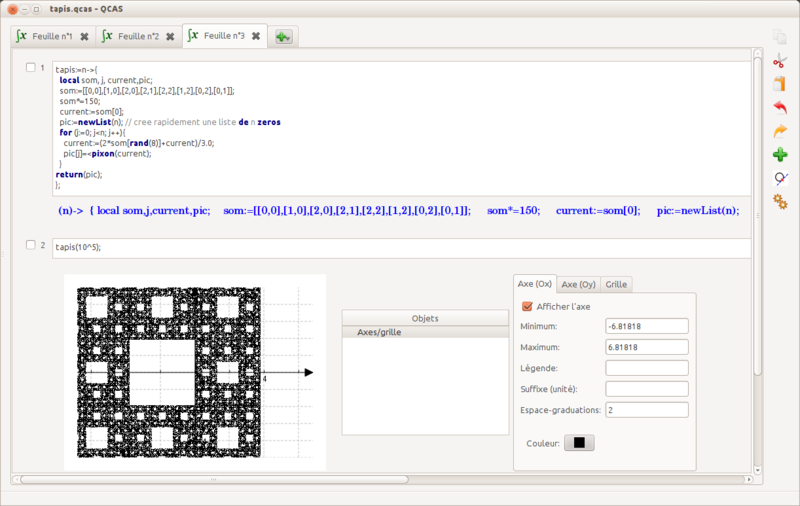 This interface can be avaible from giacpy (if this feature was enabled at built time) to display giac graphics from python. Linux: The .deb files are debian packages. They require the giac debian package to be installed. Macos X: the .pkg files are installer for macos X. They are compiled in 64bits without pari. Windows: (64bit version) the .zip or .exe files are for windows. Most current functions are available, but those binaries are cross compiled from linux with mingw with the libraries gmp,mpfr,gsl,pari, ntl.